The coldest month of the year, with daytime temperatures dropping to around 12oC, January is certainly not the best month for holidaying. The locals still enjoy around four hours of sunshine a day, however, so life is not so bad! The islands’ green interiors enjoy about 30cm of rain in preparation for spring. The temperatures in February remain at their lowest but those who grow vegetables, fruit and olives are thankful for the essential rain that falls. About five hours of sun a day keeps the locals’ spirits up but it is not enough to attract many visitors. Most tavernas are closed as their owners rest up before the season starts. March brings with it the first intimations of spring. The days are lengthening, the sun shines for around seven hours and the fruits of the winter rain start to be seen in the fields and allotments. Temperatures are still quite cool on average but the islanders’ know it’s nearly time to start preparing for business. 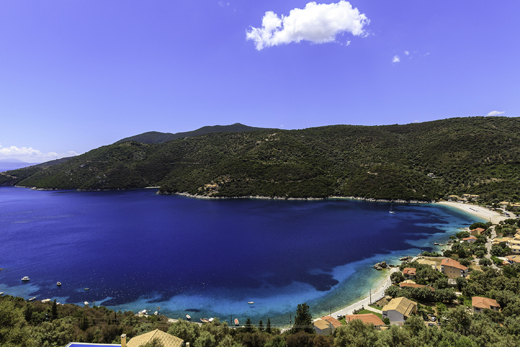 Rising in the Aegean Sea, just a few miles off Greece’’s east coast, the (northern) Sporades is an archipelago of around 25 Greek islands, though only four of these are inhabited. 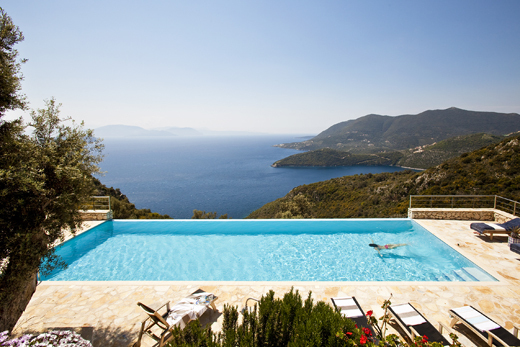 Skopelos and Alonissos are home to our inspiring collection of villas, most of which have a magical combination of pool and direct sea access. 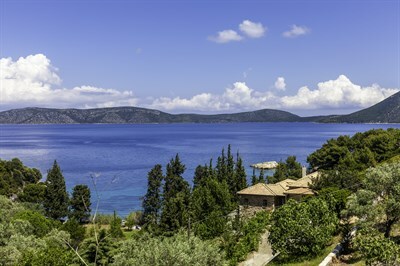 Some are also just a short walk from seafront tavernas, all have breathtaking views. Why not take a look below? All of The Thinking Traveller's villas are exclusive to us, meaning you won't find them anywhere else. Spring has arrived in all its glory. 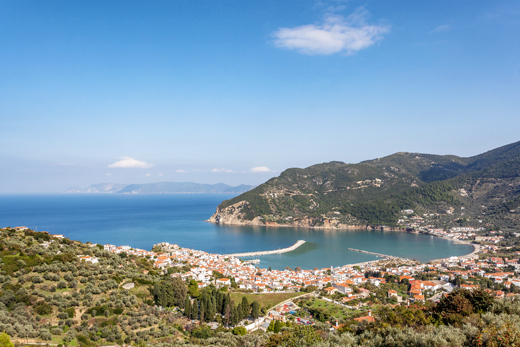 The hills of Skopelos and Alonissos are a carpet of green and colourful wild flowers. Temperatures rise to around 18oC and the first visitors, usually walkers, begin to arrive to enjoy the flourishing land and seascapes. Local tavernas begin opening up and the streets of the islands’ towns and villages are starting to liven up. With temperatures in the low 20s, around nine hours of sun per day and very little rain, the first swimmers head for the sea. The islands’ interiors are alive with bright colours and luxuriant hues of green. The first vegetable of the season are being harvested and the trickle of tourists becomes more of a stream, though anyone visiting will still have lots of space to themselves. 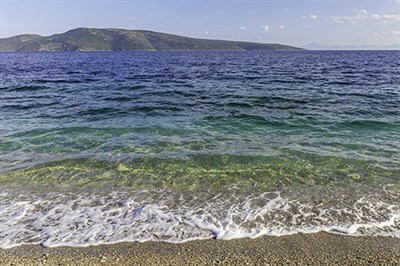 Boats that have been taken out of the water are rebaptised and a cruise around some of the minor islands in the Alonissos Marine Park is recommended. 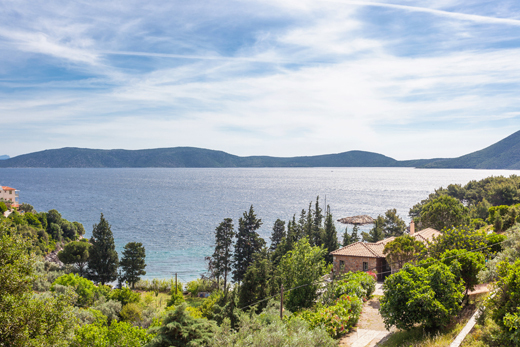 The Thinking Traveller now has villas in the Ionian Islands to the West of mainland Greece and the Sporades Islands. Across both regions you will find The Thinking Traveller's award-winning service which our clients have now enjoyed since we started in 2002. With temperature arriving to the late 20s, June is to be considered the beginning of the summer and the longest days of the year bring with them an average of 10 hours sunshine. The sea has warmed up to over 20oC and the beaches are attracting more and more people. The vast majority of tavernas are open, long lunches on the sea irresistible and life in general is once more lived out on the streets. 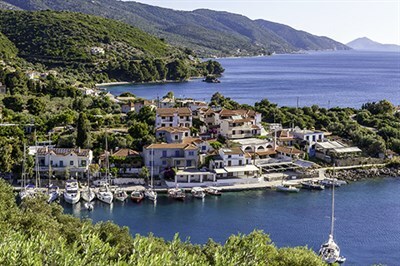 The Sporades’s tourist season is now pretty much in full swing, but in these fairly off-the-beaten-track islands this never means hordes. There’s plenty of space for everyone on the gorgeous beaches and with temperature nearing the 30oC mark, swimming in the sea is one of the most popular activities. This is not to say walking is off the menu, however, as the views from the inland hills are at their best. You’ll be pretty unlucky if you catch a drop of rain. August in the Sporades is a time for fun, relaxation and taking it easy, especially during the day when it can get quite hot. The beaches are buzzing, more yachts are docking in the marinas and still the atmosphere remains tranquil. The long days of sun lead transform into warm evenings and there is no better way to end the day than with a long al fresco dinner under the stars. A traditional Greek house with pool just an easy walk from a beautiful beach and the seafront tavernas of Steni Vala. As most visitors set off back home, ready to undertake another year of work and school, the islands settle back into something of a slumber. The weather is excellent, with temperatures in the mid-20s and the sea still enticingly warm. Towards the end of September you might get a beach all to yourself, while those who take to the hills for a long walk, there will be little chance of running into more than a few people. The days are getting shorter, but you can still expect around six hours of sunshine a day and temperatures in the low 20s. The sea continues to retain the latent summer heat and is eminently swimmable. Those working in the tourist industry are gradually winding down and taking stock of the season. As a little rain begins to fall, the last of the year’s crops are harvested. If ever there was a mellow place to spend a warm autumn week, the Sporades would be high on the list. The evenings are beginning to get cooler, though during the day it is still possible to sit outside when the sun is shining. Hardier souls take to the sea for the last swim of the year, but boats are being brought in for the winter. Most tavernas are now closed, only the essential shops remain open and the attention of the locals turns to the olive harvest, a fundamental moment in the year. 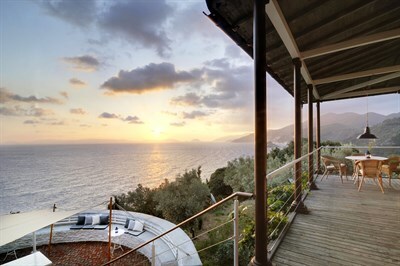 Breathtaking panoramas and pleasure-plenty terraces overlooking the picturesque harbour of Skopelos Town. Hibernation begins! With the year’s activities completed, the locals settle down for the winter, with temperature dropping to around 13oC during the day. December is the rainiest month and also the one with least sun. Over the winter little of note happens and everyone takes a well-deserved rest.